Numerous accidents in recent history involving large charter buses have caused many to question the policies, procedures, and safety of companies that include Greyhound. Accidents involving Greyhound buses on Illinois roads are becoming a growing epidemic and are a concern— whether bus companies including Greyhound are cutting corners to preserve the bottom line and if adequate measures are being taken to prevent accidents and protect passengers and innocent bystanders. If you have been injured while riding on a Greyhound bus or as the occupant of another vehicle involved in a bus accident, you may be entitled to recover compensation for the payment of medical treatment and other out of pocket expenses that resulted from your injuries. 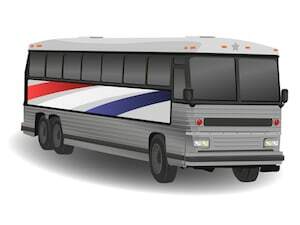 Rosenfeld Injury Lawyers LLC represents people injured in Illinois Greyhound bus accidents. For a free case review, complete the online form here, and a bus accident lawyer will be in contact with you within hours. Cheap bus fares ultimately come at a price that results in dire consequences for the passengers and those who share the roads with buses owned by large bus companies that offer these cheap fares. Compromised safety often involves a lack of maintenance, inadequate employee training programs and the use of subpar equipment. The most common causes of bus accidents include the following. Poorly maintained buses — When buses are not maintained or inspected for safety concerns on a regular basis, there is an elevated risk that critical components of the vehicle will fail, causing the driver to lose control of the bus or to be unable to avoid a collision. Defective equipment — If an accident is caused a defective device or component; it is the responsibility of both the bus company and the manufacturer to provide compensation to those who are harmed should the defect result in property damage or bodily harm. Distracted or fatigued bus drivers — Some commercial drivers are forced to work longer shifts and get far less rest between shifts despite laws that regulate the length of shifts and rest required for the safe operation of commercial vehicles. Drivers may falsify logs to work longer shifts or be encouraged to work for longer than they should. Fatigue and distractions from devices such as phones and mobile electronics increase reaction time and make it more difficult for drivers to react in time to prevent collisions. Drug and alcohol use by bus operators — Should a driver be found to be under the influence of drugs or alcohol at the time of an accident, he or she may be held liable for any injuries and property damage that result. The doctrine of vicarious liability allows victims to hold the employer responsible as well; as it is the responsibility of employers to ensure drivers do not have a history of reckless behavior and substance abuse as well as to test drivers regularly to ensure they comply with the law. If you’ve been involved in a Greyhound bus accident, it is essential to understand your rights before pursuing a lawsuit or accepting a settlement. The circumstances often dictate what you can expect from the process as well as the value of your case. Your medical bills, out of pocket expenses and pain and suffering are included in compensatory damages— the amount of compensation that is equal to the financial toll of your injuries. If you have sustained severe injuries that have a long-term economic effect or have permanently altered your quality of living, it can be difficult to place a value on your pain and suffering and long-term care. The Rosenfeld Injury Lawyers LLC regularly represent individuals who have been involved in Chicago Greyhound bus crashes such as yours and rely on the expertise of experts in medicine, bus safety operation, accident reconstruction, and economics to evaluate your case from multiple angles to ensure that your financial needs are represented accurately when pursuing compensation. Contact our Illinois bus accident attorneys for a free consultation with an attorney so that we can answer your questions and begin a thorough investigation into your matter to determine your legal options and let you know what you can expect as well as the probable value of your case. If we are unable to collect damages on your behalf, our resources and services will be free of charge.